The weekend was delightful with the deluge on Friday and Saturday arriving as a day of pure outdoor pleasure. Once the rain stopped the cleansed sky was a gorgeous azure with billowing white clouds slowly drifting as the caw-caw calls of the crows could be heard in the distance. The sound of the Canadian geese, barely seen in the distant sky in the familiar V formation, was reassuring that Nature does indeed have a plan. Observation indicates the grasshoppers have become rather lethargic, hopping slowly rather than zinging along. Thankfully their days are numbered, and between the cold and the damp, they are miserable! The ants, whose activity in the fall is always an indicator of the degree of winter we may expect, are racing about storing tiny pieces of grain. And the squirrels too are hastily assembling a stash of food for winter. The weather pattern and the critters point toward a relatively harsh winter so relishing these fall days is a must. These comfortable daytime temperatures and cool evenings have made plans for fall gardening a delightful priority. And since the rain, the wild violets have sent forth tender new leaves signaling it is time to plant the earliest spring bloomers. Their relatives, the precious pansies, have begun arriving in the nurseries and if planted now will survive nicely over the winter. Originally a common viola growing in fields and hedgerows in England their first noted appearance as a new species was on the estate of James, Lord Gambier. 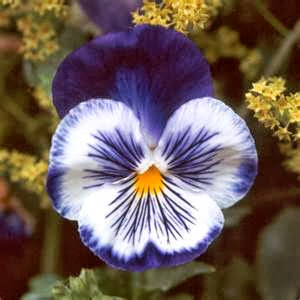 His gardener, William Thompson, crossed a viola species with a viola tricolor in an effort to achieve a round flower of overlapping petals. In the late 1830s he found by chance a flower with a broad dark blotch instead of narrow nectar guides; from this singular pansy came the future ‘flowers with a face’. Released to the public in 1839 with the name "Medora" this pansy instantly attained rock star status among gardeners and breeders throughout Europe.